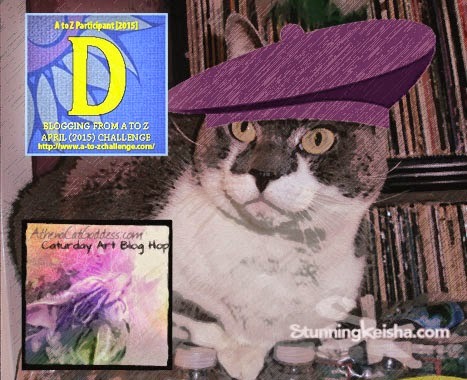 Today while I continue the Blogging From A to Z Challenge, I’ll also be Dabbling in some art for Athena and Marie’s Caturday Art Blog Hop. Everyone knows I’ll do anything on a Dare, which is how I got myself into this A to Z thing. Today D is for Dare. It’s also for Desire, which is the PhotoShop Sketch action I used on today’s badge. You didn’t think I’d miss the art blog hop, did you? I also created some stunning Easter art for you. I’ll have more tomorrow. Hmmm, now what could the word beginning with E be? D as in Dare. Lemme tell you a bit more about this sweet kitteh who was named after a female character in a video game. You might be convinced that she’s the cat you’ve been looking for. Dare is a spayed 3 1/2-year-old silver tabby girl, adoptable in the Portland, Oregon, area. She was found under a bush in a parking lot at 4 weeks old and has been an indoor-only cat ever since. She is very shy around strangers. It takes her a while to warm up to new people. Once she gets to know you, she is a loving lap-cat and snuggler. Dare is great around other cats and around kids of all ages. She loves to lick your arm when snuggling, especially when going to sleep. She is very playful, literally bouncing off the walls and racing down hallways. She'll entertain herself for 20 minutes at a time that way! She loves feather wands and laser pointers and she is great with older cats, younger cats, and kittens. Dare would really like a home with a playmate to run around with. Can you provide that home? Please contact foster Mom Karen Thompson at ktmoonblue@yahoo.com if you would like to adopt this sweet young ladycat. During this Challenge I’ll be spotlighting adoptable cats from A to Z. If you have any fosters, rescues or cats that need to be rehomed and you want them featured here, drop me an email or message the Stunning Keisha page on FB. Our featured letter A cat, Annika, was adopted. We also worked our magic when Cici, the cat we were going to feature yesterday, got her furever home. Dare is adorable, and I love your Easter art too! Your art is really cool! Dare is so cute - I hope she finds a home soon! Thanks for featuring Dare in your post today! Concats to Annika and Cici on their forever homes, and we love your Easter artwork! Dare is adorable. CK your Easter art is way cool. Have a super Saturday. OH what a beautiful girl, so sweet and huggable. Oh my Dare is so cute! Lovely artwork CK!!! Dare is darling, and great Easter Artwork too. Beautiful Dare and art! Hope she find a forever home very soon! Wow, you got many "D's" in this post. Great job! I love your Artwork! And Dare is adorable, I am sure someone will want this sweetie soon. Love your Easter art! Very colorful and pretty! Dare is adorable and sounds very sweet :-) I hope she finds her forever home very soon! Wonderful post, CK! We're loving your A-Z challenge! Dare is such a sweetie! We hope she finds a wonderful forever home very soon! Wow CK, luv yous bewet. And Dare is just gawjus. Weez be shawin' and purrayin' fur hers to get a pawsum home. Happy and blest Easter. Love all your artsy photos today! Especially the first one. And Dare is adorable! Hope the purrfect family adopts her soon! Dare is lovely and I hope she is fortunate and gets her forever home too. You are quite the stunning one CK! Hey, Dare is really a lovely one. Dare is adorable. We hope she finds a forever home soon. 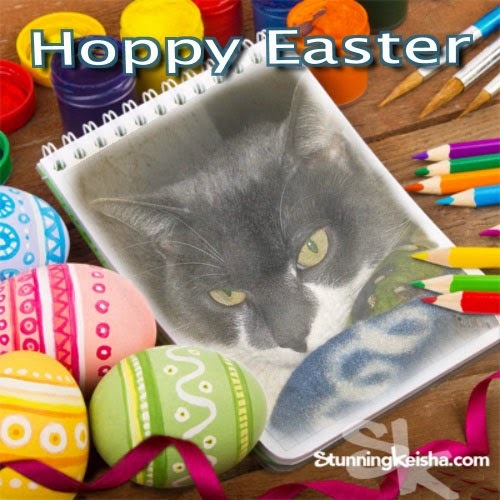 Your Easter artwork is pawsome! Love both of your graphics CK, cool! Dare is a sweetie, we send purrs her way for a wonderful forever home. Happy Easter CK! We will share your beauty CK!! Well done with the posts. We will visit every day! CK Yous beautiful! Your Mommy sure knows what to do to makes yous look great!! Has a totally marvelous time darling grrl furrend! Beautiful art. And that's exactly the kind of hat a cat would wear. I think your word should be "Dashing" because you look "Dashing" in that photo, or "Divine" cause it just dawned on me that I don't think ladycats can look "Dashing" Oh well, you look delightful!! Cool Easter art , CK ! I do hope that Dare find a foreverhome real soon !